The CHATILLON® K-DFE Series is ideal for functional capacity evaluations and job task analysis. This compact, easy-to-use force gauge has a measurement accuracy of better than 0.25% full scale. A large, easy-to-read, high resolution dot matrix LCD display supports a variety of measurements including functional capacity (Load Averaging) based on a force or a time duration. The gauge also displays normal and peak readings, pass/fail results and statistics based on up to 10 stored results. Measurements are displayed in ozf, gf, lbf, kgf and N units. The display can be inverted and displayed results may be “hidden” during testing. The K-DFE gauge comes standard with carrying case, battery adapter/charger and NIST Certificate of Calibration with data. A variety of testing fixtures are supplied standard. The K-DFE gauge has a standard RS232 digital output for exporting data to a personal computer using our TCD WEDGE application software. 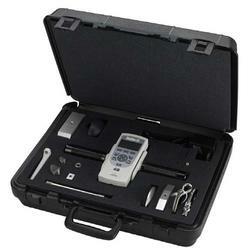 Notice - The K-DFE digital force gauge is a general purpose force measurement instrument. It is not intended for applications requiring Class 2 designation by the United States Food & Drug Administration or by Health Canada.